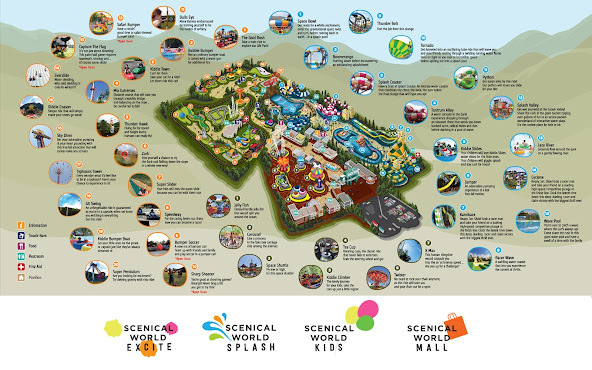 In Scenical world, Khao Yai, they have an adventure theme park, water theme park and Kiddies theme park all built in one place, which are connected together by a big mall area, where you can shop at stores or dine at the restaurants, wine bar and café. Located near to Hotel Botanica, Scenical world is a place that you can spend a day without any planned itinerary. Best of all is their ticketing system that is very flexible, where you can choose to pay only for what you play, or purchase the day pass to get unlimited access to any particular theme park or all 3 of them. When you purchase a ticket, they will provide you with a wristband which you will have to pay a deposit of THB 100, and will be refunded upon returning the wristband to the ticket counter. You just need to tag your wristband to any scanner in order to enter the park, play games or even shopping. First stop is Life Park, which is the Adventure theme park that consists of 20 types of adventurous rides and activities. Day Pass price: Adults THB 1250 / Kids THB 850 Unlimited access to all the facilities except Speed Way and Capture The Flag. If you decided to opt for pay what you play, a list of prices is listed for your reference too. Second stop, the Kids theme park that consist of 6 kid friendly facilities. Third stop, the Splash World, which is the water theme park that consists of 15 types of water rides. After all the fun, don’t forget to take a walk at the mall area. If you forget to bring swim suit or any necessary thing, you can easily buy it here at the stores.